Many of the richest energy-producing regions of the world are wrought with conflict and billions of the world's poorest suffer the daily insecurity of energy poverty. All the while our planet is increasingly under pressure because of our continued dependence on fossil fuels. It is easy to see why energy security has become one of the major global challenges of the twenty-first century. In this book, Roland Dannreuther offers a new and comprehensive approach to understanding energy security. Drawing on the latest research, he treats energy security as a value that is continually in dynamic conflict with other core values, such as economic prosperity and sustainability. The different physical properties of the key energy resources – coal, oil, gas, nuclear and renewables – are of course critical for the differing manifestations of energy insecurity. But it is the social, economic and political contexts, developed over time and place, which are essential for a fuller appreciation of contemporary energy challenges. In highlighting the history and politics of energy security and the critical role played by power and justice in framing these debates, this incisive and cutting-edge analysis is a go-to introduction for students grappling with the complexities of energy security today. Roland Dannreuther is Professor of International Relations at the University of Westminster. 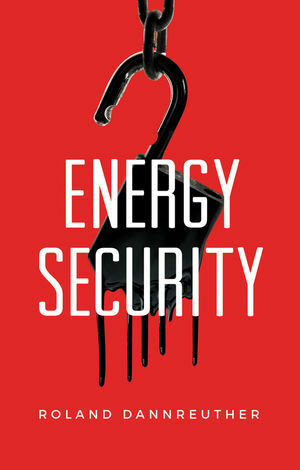 "Dannreuther's elegant and comprehensive text captures the multifaceted nature and consequences of energy security. Its inclusion of transnational dimensions, as well as social justice and sustainability, is particularly laudable. A really rewarding read." "In this book, Dannreuther critically examines the social, political, and strategic effects of energy security. It will be essential reading for anyone interested in the future of our planet."